The good news is that the boat went back into the water on Monday, Feb 14th. The bad news is that on Tuesday, Feb 15th Steve separated his tendon from his bicep on his right arm and had to undergo surgery Wednesday to reattach it. The injury happened at work during a training exercise. He is presently feeling very sore and will be wearing a cast for three weeks, then into a splint for another three weeks followed by many months of rehab. Steve will be missing out on quite a bit of racing over the next couple of months and is hoping to be better and back at it in time for the VanIsle race at the end of June. The VanIsle is a two week long race around Vancouver Island. 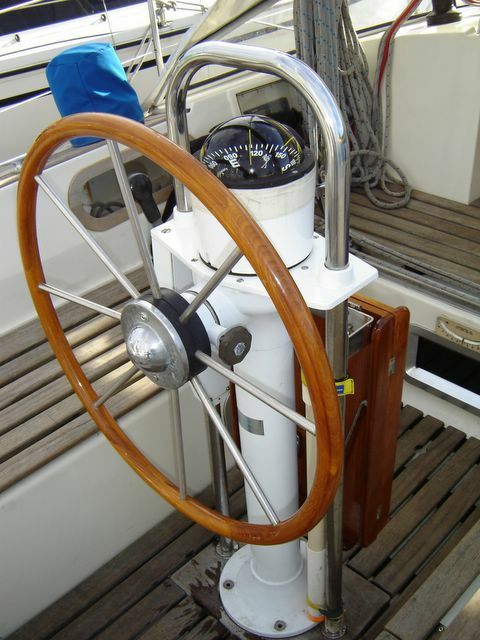 We will both be crewing on Kinetic (Beneteau 47.7). 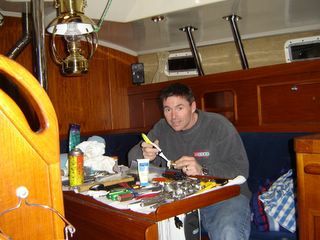 On the bright side at least we (Steve) got many of the boat tasks accomplished with just a few small jobs left for him to try and guide me through. If all else fails we will hire help. 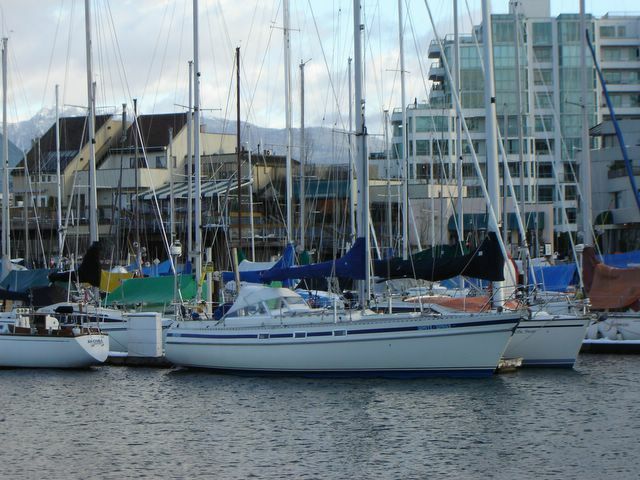 We also have the task of moving from our temporary apartment digs to the boat before the end of the month. Between my parents (who have moved us more times than I'd like to think about) and a few good friends we should manage to get it all done. Steve is happy to report that he can drink beer with his left hand just as easily as he could with his right. Well, the boat had to stay out of the water over the weekend. On the bright side the weather cooperated and we were able to cut polish and wax the entire hull. Thanks Skinny for loaning us your buffer. Hey where are your safety goggles? Don't inhale - that goop looks toxic! 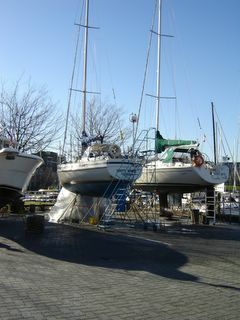 Well the boat has been out of the water since Monday, Feb 7th, it's now Friday, Feb 11th. We are working our way through the surveyor's recommendations/priority items. 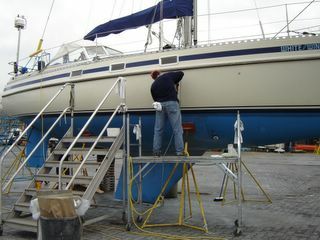 Steve has been putting in long days at the yard working with the SC Marine guys to get the jobs done and taking pictures to document our progress. Thank you mom and dad for the invaluable digital camera - we love it. 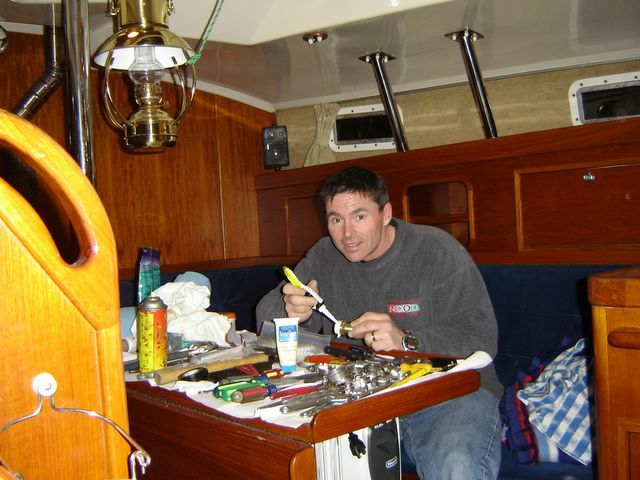 I've popped down to the yard a few times to make sure that the boys aren't cutting too many holes in our precious boat and had to disappear when I heard the sound of fiberglass being ground in the engine room. Yikes! Our poor little boat. We've been incredibly lucky with the weather this week. It's been sunny but a little on the cold side. The temperature has slightly delayed the work on the keel flange but hopefully with the heaters running it will go ahead today. 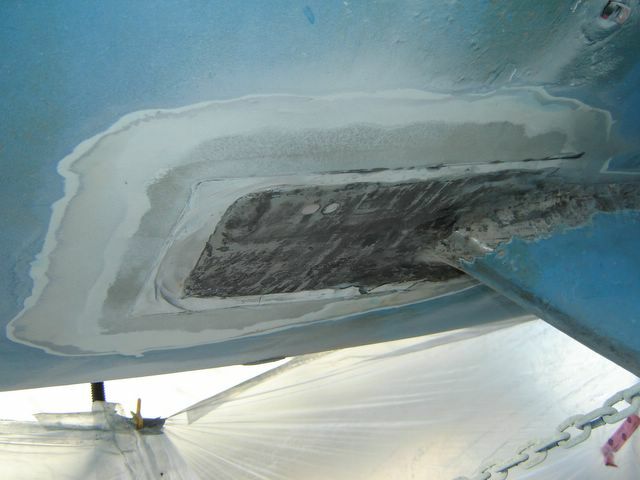 Steve has replaced all of the thru-hulls with help from our friend Al and also Matt of SC Marine. He's now moved on to removing the old name from the hull. Once that is done we have to rid the boat of everything else associated with the previous name. Sailors and their superstitions! 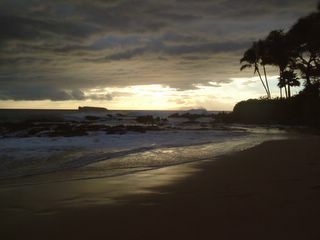 The new name will be Makena (scroll down or select Makena Beach to see why we chose this name). This weekend we'll be heading off to the boat show to spend some money and create more projects for ourselves. It also looks as though Steve and our good friend Gregg will be spending another Saturday finishing off the A/C system. All ready for the new glass work. Fiberglass forwrd of the flange was clean,dry and showed no signs of blistering. Ouch, there's just something about sight of ground away gelcoat. Actually it's not as bad as it looks and no real worry as Contest Yachts are well known for their super strong hulls. 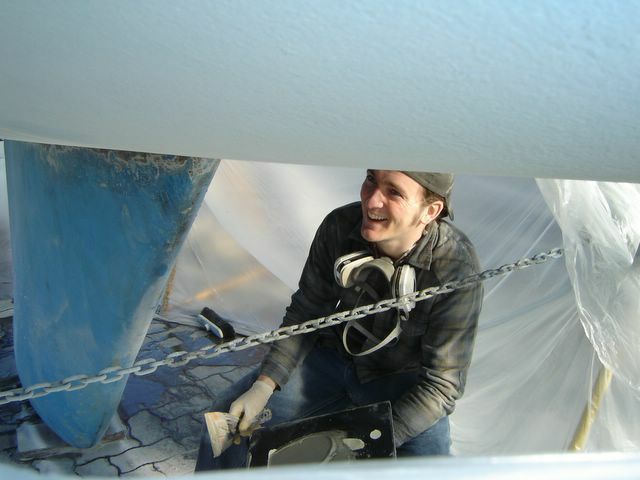 Part of the keel support is a large flange that extends forward and aft of the keel by about 10". After 20 years it was time to re-do the glass and epoxy on top of the flange. Luckily our surveyor picked up on this so we made it a priority to get on it right away. SC Marine went to work knocking out the glass over top of the keel flange and fairing compound. Once it's been ground, new epoxy and glass are applied and she's as good as new! Matt of SC Marine putting on the final touches around the keel flange. Hmm...is my new Force 10 stove going to fit? The galley isn't huge but I'm sure a few "gourmet" meals will make their way out. Two sinks and plans for a front opening fridge unit! Here is the first picture of our "new" boat. 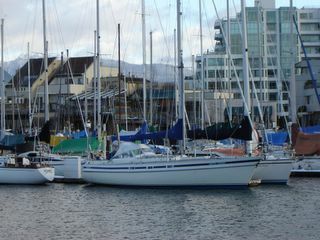 We bought her on Friday, February 4th almost the same day as when we purchased our previous boat "Psyche" a C&C 32. 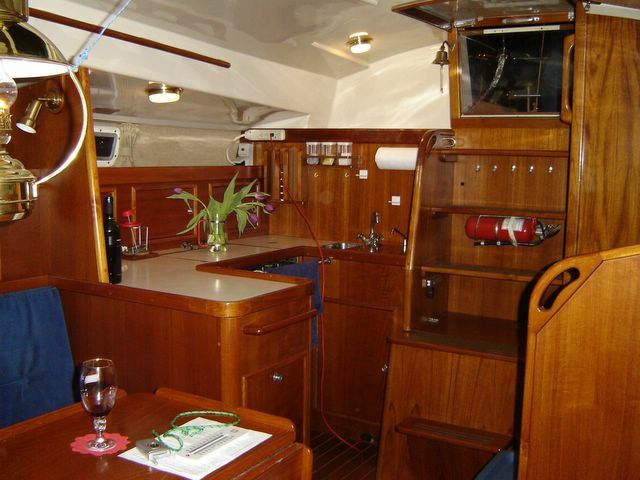 Our boat is a 1985 Contest 36S, made in Holland. The repairs and updates have already begun. 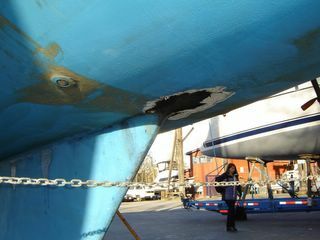 Our boat was hauled out at Granville Island on Feb 7 for some necessary repairs and a few other "extras". Steve will tell you that the new instruments were "necessary" I would say they are an "extra"so I guess it depends who you ask. Also known as Secret beach this is a little out of the way stretch of sand in Maui, Hawaii. 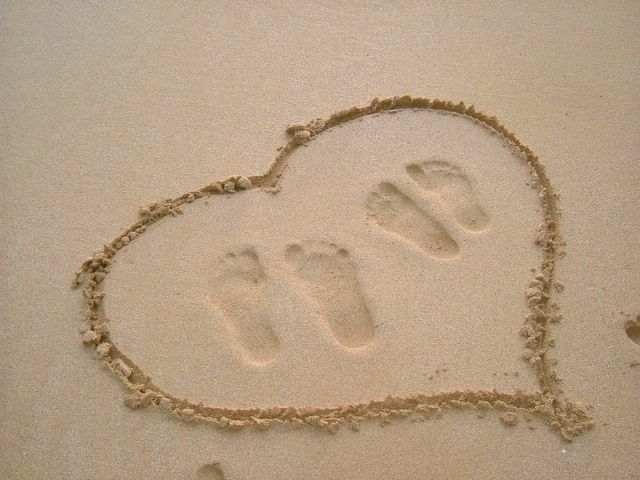 It's also where we got married barefoot in the sand on July 11, 2004. We thought it was the perfect name for our new boat invoking thoughts of warm tropical breezes, the sky a canvas of red and orange as the sun sets for the day and the sound of waves rushing the shore.